I can’t believe it but we are finally on the road to peace. It seems that the disgruntled Palestinians in Gaza have decided to help out the peace process by crossing over the border to Egypt.What does this tell me? The Palestinians are looking for an answer to the current situation. While Bush, Olmert and Abbas try to figure out the refugee problem, the Palestinians are showing us how to solve it. 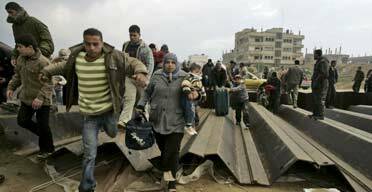 The Palestinians looked for help from their Arab brothers in Egypt and found refuge. The Egyptians said they will keep the border open as long as the “humanitarian crisis” continues in Gaza. I think the other Arab countries need to take Egypt’s example and open their doors as well. Let’s fix this mess once and for all. The Palestinians live in squalor with or without electricity and gas. They do not need aid from the Arab world; they need the Arab world to welcome them into their countries. And so it is that this whole disaster is truly a blessing in disguise for the peace process. Israel has forced the Arab world to take action. We are steps away from a “real peace”. Once the Palestinians can move out of Gaza it will obviously stop the rocket fire and destroy Hamas’ Power- since there would be no one to govern. The UN, EU and USA can throw a little money at the situation to help the Palestinians get started in their new lives and everyone can live in quiet. Isn’t that the ideal? One little game I like to play is to read your articles, and then guess who wrote them. I won this round, EASILY! When there’s a palestinian state along side Israel, then there will be peace. "On the Border of Peace" was written January 24th, 2008	by thebigfelafel, and filed under If I ran Israel and tagged Abbas, Abu Mazen, Bush, Egypt, EU, felafel, Gaza, Humanitarian crisis, Israel, Olmert, Palestinians, Posts by Molly, UN, USA.